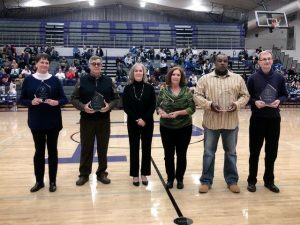 Portland High School inducted their fifth Hall of Fame class on Friday night with a ceremony during Friday night’s basketball games against Wilson Central. The 2019 class features five members who contributed to Panther athletics in various ways. Cindy Freeman was a 3-year starter for the Lady Panther basketball team from 1977-1979. Freeman was named to the district 9AA tournament team multiple times during her time at Portland as well as being named to the All-Region and All-Midstate team her senior year. Highlights for Freeman during her playing time include a 55 point outing against East Robertson and making 309 field goals during her senior season, a record that still stands today. Following her career at Portland, Freeman attended Vanderbilt on a full scholarship, where she played basketball. She lettered in 1980 in basketball before lettering in 1982 in track and field. After graduating from Vanderbilt, Freeman accepted a job with Proctor and Gamble, where she worked for 36 years before recently retiring. Curtis Marlin is a 1977 graduate of Portland High School, who made his impact off the playing field. Following his graduation from Portland, Curtis began covering Panther athletics in 1983 for The Portland Leader, where he has covered Portland sports ever since. In addition to his job covering athletics, Marlin has been relied on as a historian for Panther athletics, being a source for information for a book commemorating the 95th anniversary of Panther football. Marlin has also kept statistics for the radio broadcasts of Portland football for the past 36 seasons. A 3-year letterman, McGlothlin played for the Panther football team from 1966-1968. Most notably a quarterback and linebacker for Portland, McGlothlin led the Panthers in tackles, passing yards, rushing yards and touchdowns during his senior season. His senior season earned him spots on both the All-Cumberland Valley team and All-Mid state team as well as a spot in the TSSAA East-West All-Star Game. Following his playing career with Portland, McGlothlin signed to play football for Coach Doug Dickey and the University of Tennessee. McGlothlin was a 3-year letterman at Tennessee as well, where he contributed to the Volunteer defense. Tennessee won 3 bowl games during his time there, including the 1970 Sugar Bowl, helping the Vols to finish the season number 3 in the nation. McGlothlin is now featured on the Letterman Wall of Fame at the Volunteer football training facility. Another standout on the football field, Padgett graduated from Portland in 1972. Padgett was a 3-year starter for the Panthers at tailback, where he recorded 296 yards and two touchdowns in a game as a sophomore. He was named to the All-Cumberland Valley Conference team multiple times as well as being named Most Valuable Player of the Midstate Bowl as a senior. Following his stellar career, Padgett signed to play football at Middle Tennessee State University. Padgett also contributed on the hardwood as a 3-year letterman in basketball. As a sophomore, he set the record for most rebounds in a season with 353, including a 30-rebound game against Greenbrier. Padgett was named All-District following his senior season. A rare three-sport athlete, Rusty Wright excelled in football, basketball and baseball for the Panthers from 1979-1982. Wright started three seasons at quarterback for the Panthers, earning spots on the All-Region and All-Midstate teams both his junior and senior seasons, when he was also named team MVP. He finished his football career with 3,169 total yards of offense and 20 touchdown passes. Wright was also a 3-year letterman on the basketball court, starting at guard. He was named to the All-District tournament team in 1982. Wright really excelled on the baseball diamond, where he also lettered all 3 years as a pitcher and shortstop. Wright helped lead the team to the final four of the state tournament in his junior season, when he finished the year with a .433 batting average. He batted .476 during his senior campaign, earning him a spot in the Mid-state All-Star Game. Wright continued his baseball career at Belmont, where he started at second base all four seasons. He finished his time with the Bruins with a .322 batting average, a .475 slugging percentage and a total of 166 hits during his college career.